The rusts are amongst the most common fungal diseases of garden plants. 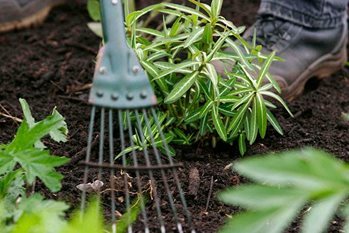 Trees, shrubs, herbaceous and bedding plants, grasses, bulbs, fruit and vegetables can all be affected. Rust diseases are unsightly and often (but not always) reduce plant vigour. In extreme cases, rust infection can even kill the plant. The rusts are a group of fungal diseases affecting the aerial parts of plants. Leaves are affected most commonly, but rust can also be found occasionally on stems and even flowers and fruit. The spore pustules produced by rusts vary in colour, according to the rust species and the type of spore that it is producing. Some rusts have complex life-cycles, involving two different host plants and up to five types of spore. No fungicides are currently available to home gardeners for the control of rust diseases on edible crops. On ornamental plants the fungicides tebuconazole (Bayer Fungus Fighter Concentrate), tebuconazole with trifloxystrobin (Bayer Fungus Fighter Plus), and triticonazole (Scotts Fungus Clear Ultra and Scotts Fungus Clear Ultra Gun) are approved for the control of rust diseases. The foliage and flowers of some ornamentals are sensitive to damage by certain fungicides. Check the product label before use. Most of the RHS Gardening Advice enquiries regarding rust occur on the following hosts: allium species, antirrhinum, bluebell, box, chrysanthemum, fuchsia, hollyhock, hypericum, mahonia, pear, pelargonium, poplar, rose and vinca. Rust fungi have very limited host ranges. For example, the rust that attacks antirrhinum is a different species from that affecting hollyhock. By late summer there may be many different rust species present on various plants in the garden. Infection is favoured by prolonged leaf wetness, so rusts are usually diseases of wet summers. Some rusts spend their entire life on one plant and produce just one or two types of spore. Others need two, often completely unrelated plants in order to complete their life-cycle, and can produce up to five different spore types. European pear rust, for example, spends part of its life on juniper. The colour of the rust pustules varies according to the rust species and the type of spore that it is producing. Rose rust, for example, produces orange pustules for much of the summer, but in late summer and autumn these are replaced by black pustules containing overwintering spores.